Under General Francisco Franco’s fascist military dictatorship in Spain, from 1939 until his death in 1975, the Spanish people endured unspeakable atrocities. Many of them remain still in silence, unknown and unacknowledged. The internationally acclaimed and multi-award winning documentary “The Silence of Others” – the product of six years of urgent filmmaking – follows, among others, the story of María, as she undertakes the daily tasks of someone who has waited her entire life to recover the remains of her mother from the gutter where she was buried after her murder. It is a life spent writing letters to public officials demanding her rights—handwritten letters full of the spirit and persistence of a person who never gives up. The letters embody the irony, hope, and resignation of someone who knows that she will have to wait “until pigs fly” for a response. Having the eyes of the world on this film brings much-needed attention to the Right to the Truth. March 24 is a global UN day that honors the memory of victims of gross and systematic human rights violations and promotes the importance of the right to truth and justice. The relatives of victims of summary executions, enforced disappearance, missing persons, abducted children, torture—this day reminds us—need to know what happened in order to obtain some degree of justice and be at peace. It is estimated, for example, in Spain – because no one knows for sure – that there are still more than 100,000 unsolved disappearances from the Civil War. That is more than 100,000 Marías and all of their family members, who are still waiting for the state and for society to pay them some attention. Thus, a country that once used the principle of universal jurisdiction to prosecute the notorious dictator Pinochet now finds itself fighting extradition requests from Argentina for crimes committed by its own nationals. Debates over the upcoming exhumation of Franco’s remains have attracted more attention in the last year than those about the exhumation of his victims have in decades. The situation is sadly ironic. The Silence of Others comes at a time when there is a historic opportunity to take a hard look at issues that are systematically ignored or hidden in the depths of our collective memory. After 40 years of democracy and despite a rampant polarization, Spain might finally be ready to break the silence and openly discuss the forced disappearances, stolen babies and family separation, and erasure of the past that remain unresolved. More broadly, citizens should go through a process of questioning how our deep-rooted ideological convictions sometimes replace respect of human rights and justice for all. But, as long as Spain lacks political parties with the long-term vision to avoid constant tension and confrontation or a strong enough sense of solidarity, it will be difficult to agree on the way forward. In the meantime, civil society and art and culture, are critical to build the foundations for dialogue, reflection, and action. Families of victims around the world have the Right to Know the Truth and gross human rights violations cannot simply be ignored. Their clarification has been a crucial part of the transitional justice process in many countries. Argentina, Chile, the countries of the former Yugoslavia, Colombia, Lebanon, Tunisia, Nepal, Cambodia, Liberia, Sri Lanka, Sierra Leone and Syria are just some of the countries that have had to, or still need to, face up to a legacy of atrocities and confront the impact of massive systemic violations of their citizens’ human rights. Whether it is caused by civil wars or authoritarian and repressive regimes, many countries have seen how at one point in their history violence became a cancer that debilitated the state and corrupted the social contract that should unite us all, destroying the relationship of trust between citizens and the state, and among citizens themselves. Recovering from that shock and reconstructing a just, democratic and inclusive society in which victims’ basic rights are upheld is a long, complex, and multidisciplinary process that requires many years of work and dedication. Through my work at ICTJ, an organization that specializes in assisting with these processes, I visit and am involved in, many of these countries. I am always struck by the ignorance of the crimes of some sectors of the society and; by the lack of empathy toward victims—the solid barrier of insensitivity that prevents us from going beyond political agendas and calculations, binary analyses, and dichotomous discourses of good and bad, left and right, communists and fascists. Countries like Spain, when they are ready to move forward from a place of paralyzing apathy, can start at the technical level: by reaching out and talking to victims, diving into their official archives, paying attention to the information collected by civil society organizations, and creating a register that will tell us exactly how many Marías are out there. The time has come to quiet down and listen to those who have lived their entire lives with present absences, not being able to mourn their loved ones. Perhaps when we listen to them and answer their letters, we can begin to find and return the disappeared, with dignity, to the thousands upon thousands of families that we have treated shamefully, coldly, and at the cost of the silence of others. 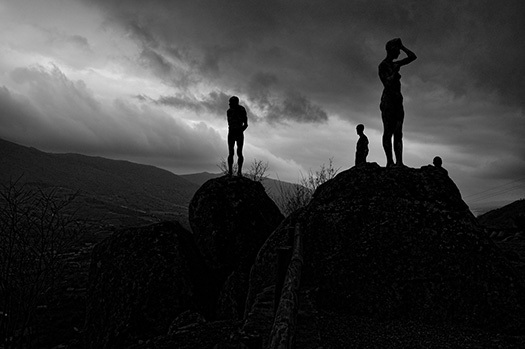 PHOTO: The statues at the Mirador de la Memoria in Spain, which is featured in the documentary, "The Silence of Others."